There is a subtle difference between a department store Hawaiian shirt and an authentic Surfer shirt. First, it should offer a complicated pattern that is eye-catching – but not in the “ouch, my eyes” sort of way, but more of a “Hmm, what’s going on there”. They should fit close to your silhouette, drape with ease, and offer a straight hem to be worn outside your pants. 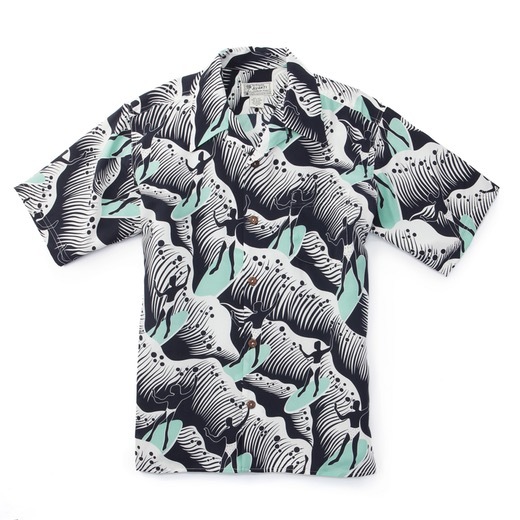 This surfer shirt by Avanti Designs features a classic, vintage print with a straight hem, coconut buttons, and is made out of 100% Crepe de Chine silk. Simple, classic, and authentic.